Do you want to know how to make bread pudding and when to make it? You will find that many times you have some bread sitting at the table, which is not stale yet not fresh enough to make a sandwich with. 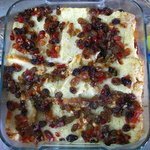 If you do not want to throw that bread away, you can use it to make a delicious old fashioned bread pudding. Although you can use any bread for this bread pudding recipe but a thick slice bread or even slices of a baguette will give best results. I find this to a be a very simple dessert recipe, which can be made with ingredients that are almost always available at home. I have used a mixture of dry fruits to sprinkle on top and in between this pudding. This gives an additional flavor to the recipe. You can avoid this completely or add a layer of jam instead. Children like it more that way. This bread pudding recipe is as easy as a recipe could get. Spread butter on one side of all the bread slices and keep aside. Brush an oven proof dish with butter and take half of the bread slices and layer evenly (butter side down). Sprinkle half of fruit and sugar. Now cover this up with the rest of the bread slices (butter side up). Spread the rest of fruits and sugar. Mix eggs and milk together and pour evenly on the bread slices. Let it rest for 30 minutes, so that the bread absorbs the liquid. Now bake in a preheated oven at 180°C for 45 minutes or until the custard sets. Serve hot or cold, it tastes delicious either way. Now that you know how to make bread pudding, would you like to browse some more simple dessert recipes?